Why does humanity get smarter and smarter? Intelligence tests have to be adjusted all the time because people score higher and higher. If the average human of today went 105 years back in time, s/he would score 130, be considered as gifted, and join clubs for highly intelligent people. How can that be? 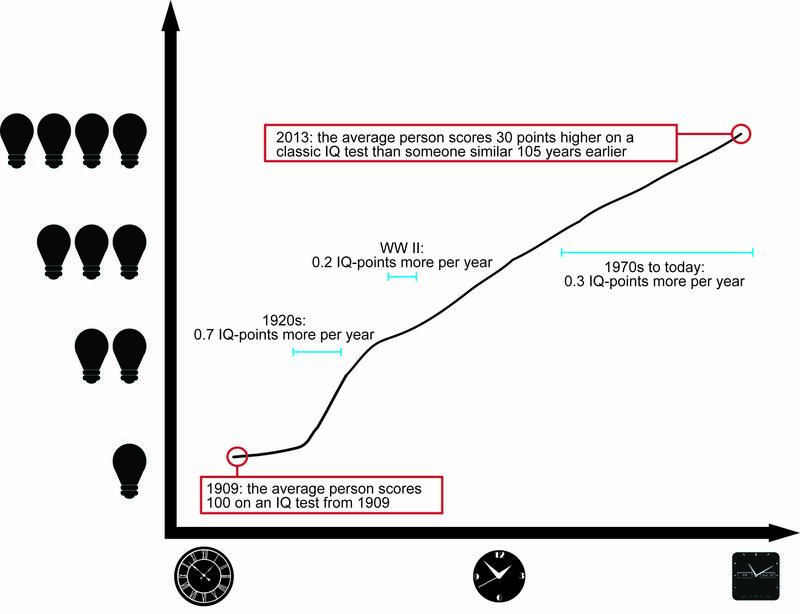 The picture above shows the development of humanity’s intelligence between 1909 and 2013. According to IQ-scores people got smarter and smarter. During the last 105 years, people’s scores increased by as much as 30 IQ-points. That is equivalent to the difference between intellectual disability and normal intelligence. Ever since the discovery of this effect by James Flynn, the underlying reason has been hotly debated. A new analysis combines all available studies into one overall picture in order to find answers. Jakob Pietschnig and Martin Voracek included all available data pertaining to IQ increases from one generation to another: nearly 4 million test takers in 105 years. They found that IQ scores sometimes increased faster and sometimes more slowly. Check the difference between the 1920s and WWII in the figure above. Moreover, different aspects of intelligence change at different speeds. So-called crystallized intelligence (knowledge about facts) increased only at a rate of 0.2 points per year. So-called fluid intelligence (abstract problem solving), on the other hand, increased much faster at 0.4 points per year. 1) better schooling: IQ growth is stronger in adults than in children, probably because adults stay longer and longer in school. 2) more experience with multiple choice tests: since the 1990s the multiple choice format has become common in schools and universities. Modern test takers are no longer put off by this way of asking questions in IQ tests and might resort to smart guessing. Am I really smarter than my father? According to the Flynn effect, my generation is 8 IQ-points smarter than that of my parents. But this only relates to performance on IQ tests. I somehow doubt that more practical, less abstract, areas show the same effect. Perhaps practical intelligence is just more difficult to measure. It is possible that we have not really become more intelligent thinkers but instead more abstract thinkers.